A: Contact your pediatric dentist as soon as possible. A: Find the tooth and rinse it gently in cool water. (Do not scrub it or clean it with soap -- use just water!) If possible, replace the tooth in the socket and hold it there with clean gauze or a wash cloth. If you can't put the tooth back in the socket, place the tooth in a clean container with milk, saliva, or water. Get to the pediatric dental office immediately. (Call the emergency number if it's after hours.) The faster you act, the better your chances of saving the tooth. A: Go immediately to the emergency room of your local hospital. A blow to the head can be life threatening. A: Call your pediatric dentist and visit the office promptly. To comfort your child, rinse the mouth with water. Apply a cold compress or ice wrapped in a cloth. Do not put heat or aspirin on the sore area. A: Absolutely! First, reduce oral injury in sports by wearing mouth guards. Second, always use a car seat for young children. Require seat belts for everyone else in the car. Third, child-proof your home to prevent falls, electrical injuries, and choking on small objects. 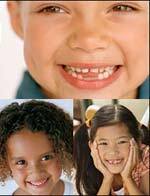 Fourth, protect your child from unnecessary toothaches with regular dental visits and preventive care.